The 2017 Techtextil North America show held in Chicago hosted 167 exhibitors from 16 countries. Co-located with JEC Americas, the event attracted 3,096 visitors from around the world, representing companies like Apple, Tesla, Reebok and more. The number of exhibitors was a 15% increase over the 2015 edition, held in Houston, Texas, and there was also a 60% growth in space rented by overseas exhibitors. The increase in Techtextil North America exhibitors reflects an optimism that appears to be present throughout the textile industry. This optimism has generated increased investments in spinning and weaving equipment in countries, including the U.S., which are seeing advancements in textile innovation and production. With Chicago located near other U.S. Midwestern cities that already have established high-tech industries, this created an added incentive for textile equipment companies to participate in the show. The FabricLink Network spoke to several equipment companies that are on the leading edge of new developments in textile equipment. 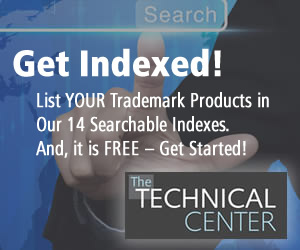 Navis TubeTex/Marshall & Williams is a developer of durable stenter equipment and technologies for technical textiles/nonwovens, and a global leader in finishing machinery for the global textile industry. Navis TubeTex/M&W is well-known for building stenters that are both robust and durable under the most adverse conditions, while running at fast speeds with minimal energy consumption. The technical textile/nonwoven stenters offer a wide range of capabilities that include: High speed/high pull abilities; Optimal drying and heating rates; Lowest energy consumption for kg processed; Heat recovery systems; Multiple Inlet/Outlet configurations to match processes; Wide range of chemical application technologies (coating, saturation, foam); Powerful/precise yet intuitive controls platform; Remote access/control; Standard widths up to 3.8 m/wider widths available; Turnkey solutions. 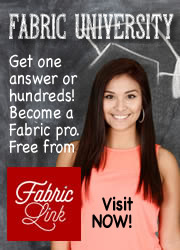 fabric finish as conventional treatment. APJeT Inc. presented its state-of-the-art atmospheric plasma system that uses an environmentally-friendly process to apply water-repellent, stain-repellent and moisture management properties to apparel fabrics. APJeT™ machines operate under atmospheric pressure and do not require vacuum systems. The plasma system creates performance garment that stay cleaner longer, are more comfortable to wear, and do not show perspiration. Yet, the cost is less than fabrics finished using the current conventional method. 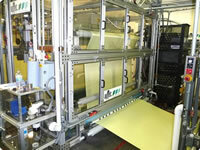 The system also uses a green process to change the surface of various substrates. No harmful emissions or waste water treatment are associated with APJeT's technology. The plasma and chemistry are applied without heat, water, or any electrical risks to the fabric, such as arcing, which can result in holes and burn marks. Through APJeT's partnerships with NC State (the home to APJe's Development Application Team), Morrison Textiles Machinery (the exclusive licensee for APJeT™ equipment), and Matheson Tri-Gas (the source for helium gas and APJe's™ related equipment), the plasma system technology utilizes an environmentally-friendly “dry” ionized gas to impart a nanolayer coating to create the performance qualities. The system provides a double benefit to textile manufacturers by eliminating the use of water and the need for wastewater remediation. Shima Seiki Mfg. 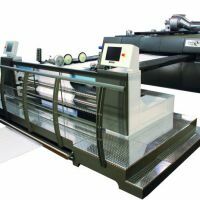 of Japan, together with its U.S. subsidiary Shima Seiki U.S.A. Inc., showcased its MACH2XS flat knitting machine at Techtextil North America. Chicago's proximity to other Midwestern cities where automotive, aerospace, biotechnology and a variety of high-tech industries are located offered an attractive opportunity for Shima Seiki to present its latest knitting applications for this versatile machine. One of Shima Seiki's focuses was on WHOLEGARMENT knitting, which maximizes the benefits of knitting for technical applications. 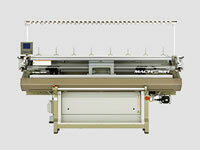 The company's computerized MACH2XS flat knitting machine, which features SlideNeedle on 4 needle beds and its patented spring-loaded full-time sinker system, enables the production of WHOLEGARMENT knitted items that incorporate complex 3D fitting for the human body. The design feature of Selective Compression allows for controlled placement of compression pressure points in sports and medical applications. The seam-free nature of WHOLEGARMENT production ensures continuity of yarn, and allows functional yarns, such as conductive yarns, to wrap around the entire body for applications in smart garments and wearable technology.